Even with the huge technological advances in alternative materials, PFM (Porcelain Fused to Metal) prosthetics are still the most widely prescribed replacement for natural dentition. 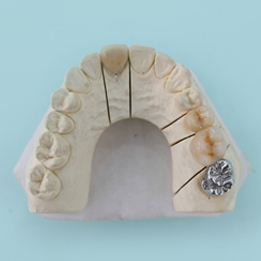 The PFM crown is a tried-and-true restoration that provides strength and durability. It could be the only option for those difficult and complex situations that require precision attachments, or require high strength in situations with minimal room. PFM crowns look like natural teeth and are stronger than all-ceramic crowns. Esthetic: Porcelain fused to metal crowns remain one of dentistry′s primary restorations of choice because, when properly constructed and seated, they are strong, reliable and esthetic. The porcelains used at our lab incorporate optical properties that parallel natural tooth structure resulting in superior esthetics. 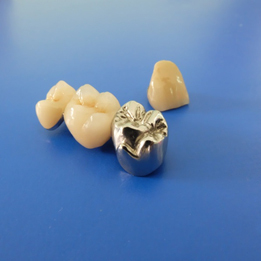 Function: From single units to roundhouse bridges, porcelain fused to metal has the versatility for the job. 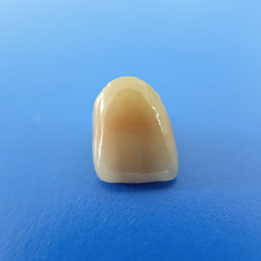 Plus, the very fine leucite crystals in our porcelains result in a combination of high wear resistance and forgiveness to surrounding dentition. Our dedicated team of technicians use their skills in the blending of today’s materials to create highly esthetic, yet functional restorations. • Good for large-span bridges. The porcelain portion can be chipped off and the underlying metal can peer through as a dark line. PFM crowns also wear down, and can show more of the dark line as the gum recedes. • High noble yellow – Precious. These alloys have over 60% noble metal (gold, platinum, palladium) content. Our high precious alloy contains more than 80% gold. High noble metal is one of the easiest alloys to adjust. Yellow gold high noble alloy offers the best esthetics over any other PFM restoration. • High noble white – Semiprecious. These alloys have over 60% noble metal (gold, platinum, palladium) content. Our semi-precious alloy contains more than 50% gold. 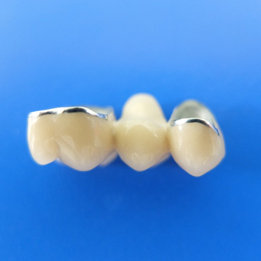 Semi-precious crowns offer a more hypoallergenic restoration over base metal crowns at a more affordable cost over precious crowns. • Noble alloys – Palladium base. These alloys have over 25% noble metal (gold, platinum, palladium) content. Our noble alloy contains primarily palladium and silver, and provide the most affordable noble metal option. • Base Metal – Nonprecious. Base metal alloys are considered to be the most economical PFM restoration. Our base metal alloys do not contain nickel and beryllium. • Ideal restoration for anterior and posterior crowns and bridges. • Cases requiring precision attachments or when minimal inter-occlusal space is available. • Highly esthetic cases with minimal prep reduction. • Any resin modified glass ionomer luting agent.